There was a lot of calendar planning at our recent club meeting — a well-attended and sociable gathering at Tir na nOg. This Friday we go to Ramelton for a bowls evening with Cecil and Tanya. Two days later, one of the highlights of the coming quarter is undoubtedly the Audrey Jacob Northwest Team Challenge on Sunday, 24 April, in Eglinton. Hot on its heels comes the start of training sessions for our 10th Anniversary Musical Ride. Valerie Craig will use all her craft and expertise to put order on the troops over a series of three Fridays in Harley’s arena, Trentagh (29 April, 6 and 13 May). The formal performance of the musical ride will take place on the beach in Rathmullan on Saturday 21 May at 11am. Our annual camping trip to the seaside at Carrickfinn is scheduled for Saturday 7 & Sunday 8 May. Novenas and every other means of assistance are appreciated in the effort to secure good weather for the first time in a few years! The RDS Team Qualifier takes place at Tubberbride, Sligo on Sunday 15 May. Maybe this will be the year when we finally make the journey to Dublin — wouldn’t it be wonderful! In the meantime, the qualifier itself is a great day out and all support will be greatly appreciated. Ride-outs and lessons dot the riding club landscape and you can shortly get full details on the Calendar page of the website. Sates for all the usual club shows are set in stone now and we have Inishowen Show on 22 May, the Beach Show a week later on 29 May, and our own Derby & Dressage Show on 26 June to look forward to. Add to this the 2-Phase Cross Country & Dressage League on Sundays 3 July (Gaeltachts), 7 August (Tirconaill) and 11 September (Letterkenny) and there really is no excuse for boredom for quite a while to come! This time two weeks from now, let’s hope we still have two glorious cups safely locked in the Letterkenny trophy cabinet! Last year’s Challenge saw victory for both our dressage riders and our show jumpers. It’s a tall order to repeat the feat but let’s give it our best shot. Contact Francis to let him know if you’re interested in riding on a show jumping team, and contact Vera if you’re up for riding on a dressage team. So near and yet so far… Our gallant team riders finished a memorable third in the RDS qualifier in Sligo this afternoon while our Donegal Gaeltacht neighbours again set sail for Dublin in August. Congratulations everybody on a very, very fine effort. We’re proud of you. Go Donegal! Despite a cracking effort from Leo, Anne, Cormac and Damien, a few rolled poles and unlucky time faults kept us out of the running at today’s team qualifier at Tubberbride. Fielding their usual horde of teams, Benbulben were the only club with a team to finish on a zero score. Tynagh took the wildcard spot and head to Stradbally for a second crack at qualification. Congratulations to Rosann who took the best turned out award on the day. Great to see the club out competing at a regional event. Let’s hope we see lots more of them over the summer. Thanks to our four gallant riders and their loyal troop of foot soldiers for representing Letterkenny with such enthusiasm and commitment at this most competitive of events. We’re very proud of you. The big day is approaching fast and the running order for teams at the RDS qualifier has now been published — and Letterkenny is first into the lions’ den! No better man for that job than Leo on the aptly named Cool! Best of luck everybody. 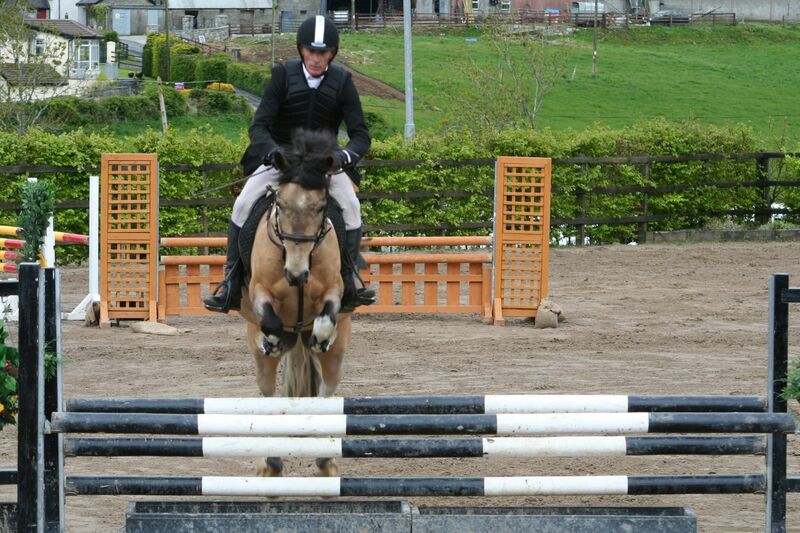 Pictured below: Leo on Cool delivering one of their two fine clear rounds at last year’s qualifier in Tubberbride. Following on Cormac’s text last week, will any of you who are interested in representing the club at the RDS qualifier on the last Sunday in May please contact Francis without further delay. He needs to get training organised so that this year we can qualify! Cormac’s collection of photos from Sunday are now added to the Gallery and include some lovely shots of the parade. Scroll down to the end of the collection to find them. If anybody else has photos, wing them through to Libby so that we can all see them! Scroll yet further and you’ll see the collection that Rosaleen Harkin of the Gaeltachts kindly passed on to us. Many thanks, Rosaleen! Professional photographs were also taken on the day by Monica Flanagan and can be viewed and purchased on the photographer’s website. 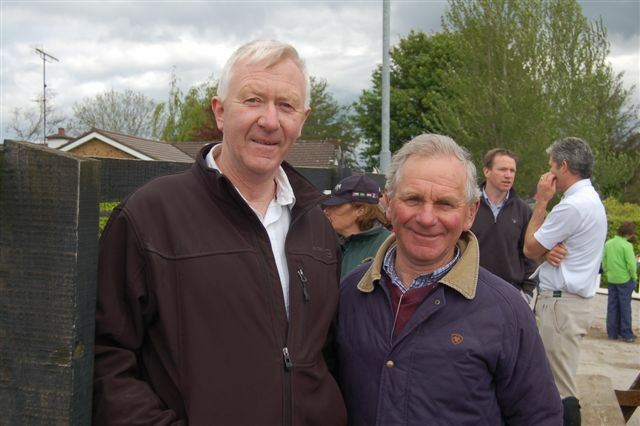 Pictured below: Renowned show jumper Cormac McCormack meets local rider Francis Kerins at Tubberbride. Seven or eight members have set their sights on the AIRC National Hunter Trials at Gurteen College on Sunday 14 April. Foot soldiers are guaranteed a good time at the event and last year the club had a mighty band of non-riding supporters cheering our (very successful) competitors home. Finding schooling opportunities before the event is always somewhat tricky. Mona of Tirconaill has organised a session at Castle Leslie on Saturday 6 April and, weather permitting, competitors will also have an opportunity to school over Gabriel’s course closer to home. The pride of the club will be at stake on Sunday 28 April as we take on our friends and rivals from neighbouring clubs in both show jumping and dressage team challenges. Our aim is to field as many teams as possible on the day. You can choose to do either dressage or show jumping or — better still — both. Rules for the Challenge will be finalised shortly. Vera will coordinate the dressage teams and Francis will do the same for the show jumpers. Entries will need to be made in advance of the big day. John, Rachel and Louise made the mistake of not attending the meeting and landed themselves the job of coordinating our Derby & Dressage show on Sunday 12 May at Hillsborough Farm. They will schedule a meeting to organise manoeuvres in advance. Course building and general prep will take place on Friday 10 May. We’ve made a club decision to buy rustic and white poles in an effort to improve the “derby” character of the event. We hope to have a really good entry at the show so make sure your horse is fit and you clear your calendar of all other commitments! We need members riding — we’re not short of help on the ground! A derby is a very achievable competition. The course is longer than a standard jumping course and about half of the fences will have a natural or rustic character. You’ll find your horse loves it and the exhilaration of jumping on grass is unbeatable. Vera is coordinating the club effort to field a team at the regional team dressage qualifier at Dalysgrove near Ballinasloe on Sunday 19 May. A strong cohort of committed riders including Claire Kelly, Hazel, Vera and Anne Chambers plan to make the event. It’s a very long journey for a qualifier and their commitment is admirable. Anybody who’s interested in joining this group should contact Vera. The RDS qualifier takes place at Kerins’s in Collooney, just short of Sligo, on Sunday 26 May. The tension and excitement of this competition is unique. Last year we didn’t field a team but this year it looks like we have plenty of candidates and barrowloads of enthusiasm. Contact Francis as early as possible, if you’re interested in competing. We’re entitled to enter two teams and further teams are possible at the discretion of the organisers. The June Bank Holiday weekend brings one of the highlights of the year — the Gaeltacht’s Beach Show. Say no more. Don’t miss it. Last year nobody from the club travelled to the Festival. This year Libby hopes to make the journey and maybe one or two others will also head for the largest amateur riding event in the land. Entries close far in advance of the show so keep an eye on the AIRC site, if you are thinking of going on the adventure. The Festival features a vast range of dressage, showing and show jumping classes. Good for Inishowen: barely six months out of the blocks and they’re jumping in at the deep end with a show on Sunday 16 June. Make a huge effort to get out and support them. Our experience could be a great help to them and there’s probably lots we can do to help them out with the running of the event. As a respite from the competitive side of life, we have ride-outs planned in different parts of our territory. Anne, Leo and Hazel will guide us along routes ranging from Burt to Stranorlar to Kilmacrennan. There’s nothing nicer than ending the week with a sociable ride-out on our long spring and summer evenings. Note that riders are now going to contribute €5 on each ride-out evening. This will help support the occasional tuition evenings where numbers are too low to cover costs and allow us to continue our flat rate €15 price for lessons. June will see us out for some informal cross country schooling on Friday evenings. We hope to visit Audrey and Tanya in Castleshanaghan and Marina and Enda in St Johnston. You don’t even have to like jumping for these sessions — you might be just as happy riding around the big fields and enjoying the open country on the flat. Your horse will certainly love it! So, no shortage of activity and events over the coming months. Make sure you get out and make the most of it all. Let’s hope the weather plays along! The Western Region team show jumping championship qualifier takes place on the last Sunday in May. If time continues to fly by at its current rate, it will all be over before we have time to blink. The competition is open to riders graded Intermediate or above. If you’re interested in representing the club on a team, contact Francis on 086 372 2542 without further delay. He will be arranging training sessions over the weeks leading up to the qualifier.